Class Day speaker Soledad O’Brien said her travels have shown her that people around the world aren’t so different in their dreams. Bad things happen unless good people put a stop to them, she said. Graduates should be those good people and seek to understand others. 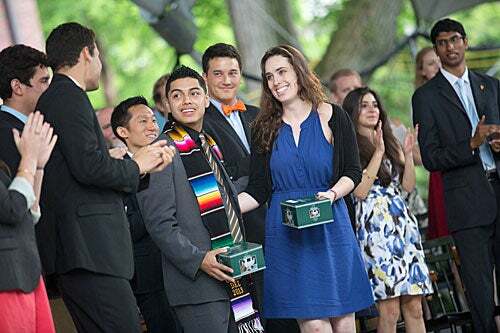 Graduating seniors bid farewell to their Harvard years Wednesday, during Class Day ceremonies that featured light-hearted remembrances, sage advice about not taking advice, and a tongue-in-cheek idea for honoring the college experience. Former CNN anchor Soledad O’Brien, the day’s main speaker, used lessons from her own and her parents’ lives as she counseled students to follow their own paths. O’Brien is the daughter of a black Cuban mother and a white Australian father who in 1958 traveled from Maryland, where interracial marriage was illegal, to Washington, D.C., to wed, against the advice of many people around them. The couple was then advised not to have children, because mixed race children wouldn’t be accepted in the world. They ignored that advice and had six, all of whom graduated from Harvard. O’Brien took her own advice as a student. Though she came to Harvard interested in becoming a doctor, she switched to English and American literature and language in response to an urge to tell stories. She left in the spring of her senior year, 1988, missing her own Class Day and Commencement, to pursue a job opportunity. In 2000 she returned to complete her studies. Early in her career, O’Brien worked locally, at WBZ-TV. Then it was on to NBC News, where she anchored “Weekend Today” and the technology program “The Site.” She moved to CNN in 2003, anchoring “American Morning” until 2007. Most recently, she anchored CNN’s “Starting Point” from 2012 until March of this year, when she left to start her own production company, Starfish Media. O’Brien won an Emmy in 2011 for “Crisis in Haiti.” She was part of reporting teams that won awards for coverage of the BP oil spill, Hurricane Katrina, and the Southeast Asia tsunami. She will serve as a distinguished visiting fellow next year at the Harvard Graduate School of Education. O’Brien said her travels have shown her that people around the world aren’t so different in their dreams. Bad things happen unless good people put a stop to them, she said. Graduates should be those good people and seek to understand others. In addition to O’Brien’s speech and the Ivy orations, students heard two Harvard orations from class members, and a brief address from outgoing Harvard College Dean Evelynn M. Hammonds. Victor Flores (second from left) and Sara Lytle were the recipients of the Ames Award. The day also featured a moment of silence in memory of classmate Philip Streich, who died in 2012 in an accident on his family’s farm, as well as the naming of the Ames Award winners, Victor Flores and Sara Lytle. The Ames Award, named after two brothers who gave their lives to save their father after he washed overboard during a 1935 storm off Newfoundland, go annually to “unsung heroes” in the class who have shown heroic character and inspiring leadership in efforts to help others. Flores was active in the Phillips Brooks House Association, helping disadvantaged children through after-school and summer camp programs. Lytle dedicated herself to improving mental health in the Harvard community, working as a peer counselor, and also worked to improve Boston schoolchildren’s self-esteem with theater.